Over-ear headphones are the best sounding headphones in the market. Period! The big drivers in them pump out deeper bass, providing an ultimate sound experience overall. Apart from that, the over-ear headphones also create a tight seal around the ears, offering a good level of noise isolation. Today, we are going to help you in choosing the best over-ear headphones for yourself. Below you can find the reviews for the top 10 over-ear headphones that we think could be great for every listener. Most of the headphones on this list are from some of the most trusted brands in the industry like Bose, Sony, Beats, etc. 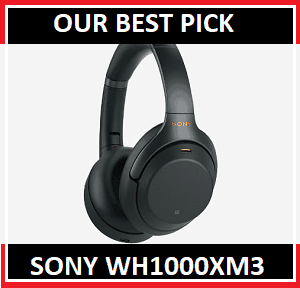 In our opinion, the WH1000XM3 are the most beautiful and technology advanced headphones that have been ever created by Sony. Additionally, we also think that the Active noise cancelation on these headphones is better than what we get to see in Bose QC 35 II. 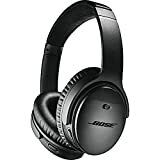 Being one of the biggest fans of Bose, that’s hard to admit, and we really hope that Bose would improve it’s ANC further in the next version of QC headphones. The most interesting feature on the Sony XM3 is the intuitive touch controls that are placed on the top of the earcups. Integrated Best-In-class Active Nosie cancelation. Alexa enabled for access to everything. Intuitive touch controls for major functionalities. Quick attention mode (more information below). Premium build quality and neat design. 30 hours of battery range with fast charge. Sony is a legendary manufacturer of audio products. Speakers, headphones, earphones, you name it, they got excellent products in every segment. And, it’s true that we all have been a die-heart fan of Sony at some point in time. The WH1000XM3 are expensive headphones that are ruling the market as of now. They are the successor to the very popular WH1000XM2, which had almost similar design and functionalities. The two things where these Sony headphones excel are the intuitive touch controls and the high-end Active Noise cancelation technology. Taking about the intuitive touch controls first, on the earcups, you get a flat surface with no physical buttons at all. All you have to do is touch on the left and right side of the earcup to change the tracks, touch on top and bottom on the front side of the earcup to adjust volume and touch on the very center to play/pause the music or answer/reject calls. You can also activate the voice assistants from the right earcup just by touching and holding it for 3 seconds. Other than that you can also use this touch surface to activate the Quick attention mode. First of all, you need to know that Quick attention mode is not an exclusive technology, it’s pretty common in Noise canceling headphones, it’s just that every company has given a different name to this technology. The technology basically allows you to hear the ambient noises (surround sounds) even when the noise cancelation is active. As soon as you turn it on by placing your hand on the earcups, it instantly turns down the volume, and cancels out the noise cancelation, allowing you to hear the ambient noises. As soon as you remove your hand, the things would go back to normal. We genuinely think that every noise-canceling headset should have this technology integrated. The other great thing about these headphones is the battery range. 3o hours of battery range on an ANC enabled headset is staggering. The headphones also have the quick charge technology integrated, which means you can actually get 5 hours of usage on a charge of 10 mins, which is very awesome. For noise cancelation, the headphones use ANC technology as similar to Qc35, but it is kind of dynamic over here. It automatically adjusts the levels of noise cancelation depending on the type of ambient noises you are surrounded with. Nonetheless, it’s smart and powerful. You can mute everything from the light traffic noises to heavy noises of an airplane cabin. Talking about sound quality, the headphones deliver rich and crisp audio. The 40mm large drivers on the XM3 produces precise bass with high-resolution audio that could be customized from the Sony mobile app built for the headphones. You would be surprised to see the depths you can go to customize settings. We highly recommend you to check out the app. Premium design and robust build quality. 30 hours of insane battery range. Touch controls, no physical buttons. For all the fans of Sony accessories, these are the best over ear sony headphones you can get right now. They got great sound, probably the best noise cancelation, a beautiful design and above all elegant touch controls. Though they are a bit pricey, they offer alot of value to the consumer. If you’re an audiophile like us, you would be faimiliar with the Bose company. It is one of the leading manufacturers of premium audio products, and QC35 from them is a holy grail of wireless over-ear headphones. According to us, and some of the other experts in the industry, the Bose QC 35 features the best active noise cancelation technology after Sony M3. And along with that, there are a lot of other great things about these headphones that you’ll love. Built-in Alexa with full controls. World class Active noise cancelation technology. Personalize settings through Bose connect app. Three levels of active noise cancelation for different environments. 20 hours of battery range. We would like to start off by saying that these are definitely not cheap. They might not be the most expensive headphones, but they are still pretty expensive. But we would also like to say that every penny spent on them is totally worth it. As usual, let’s talk about the design and the build quality first. The body of the headset is build up of high-grade plastic with comfortable cushion padding on the headband and earcups. The design is not the prettiest, but it looks really good. The headphones are available in two colors: Black and Silver. On both the earcups you get a few buttons to control some important functionalities of the headphones. A button to turn on Bluetooth and NFC, a multi-function button to turn on Google Voice assistant and Siri, volume controls, a button to turn on Alexa, and then a button to switch between three modes of active noise cancelation: high, low and off. Though the headphones use Bluetooth 4.1 for connectivity and not the very latest Bluetooth 5.0, it still holds the connection firmly and provides a standard connectivity range of 33 feet. The battery on the headphones is simply outstanding. You get a range of 20 hours of battery range on wireless mode and 40 hours when hitched with the cord. Talking about the active noise cancelation on Quite comfort 25, it’s brilliant. It works great for all the scenarios and you won’t be able to hear anything, not even the white noise that is generated by a few of the “noise canceling headphones”. The level of noise canceling can be set as per the need. If you are indoor and you don’t need it at all, you can just turn it off (this would add some extra hours to the battery range). If you are in a place with less noise like crowded office, or traffic, you can keep it on the low level, and when you are in most noisy places like Airplane, you can keep it on the high level. The noise canceling mechanism is not just present for the audio, but also on the microphone for seamless calls. Bose has integrated a noise rejecting dual-microphone system that cancels out the ambient noises and delivers crystal clear voice calls to your recipients. The sound that Bose QC35 produces is incredible. The audio is highly detailed, and you can hear each and every aspect very clearly. Combine it with crisp bass, and you get an amazing audio experience overall. The headphones detect the type of music you are playing and them optimizes the sound automatically, no need of equalizer for that. The best thing about the Bose headphones is the Bose connect mobile app that comes along. The app won’t do anything much in terms of sound quality, but it can control most of the other features. You can control noise cancelation levels, manage Bluetooth connections, perform firmware updates and much more. Very impressive active noise cancelation. Staggering battery range of 20 hours. Highly-detailed audio reproduction with precise bass. Yes, these headphones are expensive, but they also deliver a world class audio experience. The Active noise cancelation on these headphones is one of the best that we have ever tested, and they are also one of the most comfortable over ear headphones on this list. Beats is one of the oldest headphones brands in the market which is known for creating excellent sounding headphones. The Studio3 wireless are pure ANC equipped headphones that are available in a lot of color variants. The best thing about the Studio3 wireless headphones is the fast charging functionality. You can get 3 hours of music playback on just 10 minutes of charging. Extremely beautiful design that’s also very comfortable. Class 1 Bluetooth integration for Apple devices. 22 hours of impressive battery range. Most of the time we struggle with the color variants of the headphones and then end up either buying black or white colored headphones. The headphones usually come in 3 or 4 basic color variants only, which means we don’t actually have a lot of choose from. But, things are different in the case of Studio3 wireless. These headphones come in a total of 15 variants, and there is not a single variant that we don’t like. All of them are on matte finish and look great. It would be irrelevant to name all the 15 variants here, but we would like to suggest two of the variants that are our absolute favorites. Those two variants are Midnight Black & Raptors white. The design of the headphones is minimalistic and the build quality is fantastic. The headphones are build up of all plastic, which doesn’t look cheap at all. The cushion padding on the earcups is quite thick and very soft, that not only provides comfort but also helps in creating an isolated environment. These soft ear cushions come with ergonomic pivoting and advance venting that allows them to fit any head sizes perfectly. On the earcups you get multiple controls buttons for skipping tracks, adjusting volume, answering/rejecting calls, and also activate your mobile assistants like Google Now and Siri. In terms of noise cancelation, the Studio3 wireless features Pure adaptive noise cancelation, instead of Active noise cancelation. Both technologies are a little different. Active cancelation basically cancels out everything, Adaptive noise cancelation, on the other hand, is a dynamic thing that automatically adjusts the Noise cancelation level based on the surrounding noises. Even though the noise cancelation technology used is an advanced one, it’s still not as good as QC35 or Sony M3. if Noise cancelation is on top of the checklist, then go for the other two headphones. For connectivity, studio3 uses standard Bluetooth that would work with all the Bluetooth enabled devices. Additionally, they also come with Apple W1 chip for class 1 Bluetooth connectivity, which allows longer and stronger connectivity with devices running on iOS 10, macOS Sierra, Watch OS3 and later versions. Along with connectivity, the battery range is good too. You can use them for 22 hours straight on a single charge, or 40 hours if you plan to turn off the noise cancelation. Unlike most of the headphones, best Studio3 wireless also supports quick charging, which comes out really handy. The audio quality that the headphones deliver is nothing but premium. The mid and highs are perfect, and the low end is good. The headphones really stand out when it comes to EDM and Hip hop music. The bass is good, but if we compare it to the QC35 on this list, then the QC35 is the clear winner. But that’s okay since both the headphones have their own plus points. Excellent battery range of 22 hours. W1 chip for Apple devices. Premium quality sound, especially for EDMs. Active noise cancelation needs improvement. Though the noise cancelation is not perfect, the design is outstanding and build quality is pretty solid. For someone who is more into Hip Hop, EDM, Pop, and Rock would deffinitely love thir sound quality. Also, if you own a Apple device, then W1 chip is a big reason to consider them. Beyerdynamic is a very popular brand when it comes to studio grade headphones. The company is known for creating some really high quality open back headphones, that are used by a lot of music professionals. The DT880 premium edition over here is a semi-open back headset that offers stereo sounds along with some really good comfort quality. Soft velvet padding on ear cups. Available in 32 OHM, 250 OHM, and 600 OHM variants. Gold vaporized stereo mini jack. The audio experience on Dt880 would be quite different than any other headphones. Most of the headphones that people use are either open back or closed back, only a few of them use semi-open-back headphones. Semi-back open headphones deliver natural and vibrant sound, while slightly attenuating the ambient noises. DT series from Beyerdynamic is a popular series of professional headphones. DT880 has a fully open back variant that ideally created for studio purpose, the DT880 premium semi-open is designed to be used with Mobile phones and tablet. The look of the DT880 premium is very similar to like any other Beyerdynamic headphones. The body is very lightweight and extremely flexible. On the headband, you get the leather padding, and on the earcups, you get the soft velvet padding. Overall all of these things make the headphones very comfortable ones. The sound quality on the DT880 premium is very natural with deep bass. Nothing has been overdone, everything looks precise. The music sounds distinctive and you can clearly hear the minute details. The sound quality on these and DT880 pro is not very distinctive, but there surely some difference on the comfort part. The DT880 premium fits not too tight on the ear, while the 880 pros fit tight so that they don’t get displaced during faster movements in the studio. This actually allows you to use the headphones for a longer period of time. As mentioned in the specifications the Dt880 premium is available in 3 variants: 32 OHM variant, 250 OHM variant, and 600 OHM variant. All of them come at a different price point. The 32 Ohm version is ideally made for usage on mobile phone, tablets or even laptops. The 250 Ohm version is set up for home stereo systems. The 600 ohm would work best with Hi-Fi audio system with power headphone outputs or with headphones amplifiers. Natural and detailed audio reproduction. Beyerdynamic DT880 premium is ideal for those who like to use their headphones for both personal nd slight professional use. They are not cheap, but they are not too expensive either. The sound quality is great, the bass is precise, and the comfort quality is excellent. In the past few years, Cowin has gained alot of popularity in the headphones market. First, they E7 got popular, and then the E8 came along. Both of which are budgeted Active Noise-canceling Headphones. The only reason why we are SE7 today instead of the immensely popular E8 is the overall design. The E8 surely looks great, but we think the SE7 looks even better. Most of the technical functionalities on both headphones are the same. 30 hours of music playback on a single charge. Uses Bluetooth 5.0 for connectivity. Protein Earpads and foldable design. Available in 5 beautiful colors. The design of the headphones is the best part. First of all, it’s a foldable design, which makes them very portable to carry around. The body of the headphones is in all matte finish built up of all plastic. The company has brought forward some really exciting colors for these headphones. We picked up the dark green color and we just can’t tell you how beautiful they were. Along with the design of the headphones, the manufacturer has given equal importance to comfort quality. You get a light padding on the center of the headband and protein earpads covering on the earcups. For those who don’t know, the protein earpads are usually more comfortable than the cushion padding. Few things that really caught our attention were the Bluetooth technology that is used on these headphones and the battery range that they can provide. 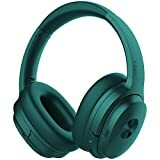 The headphones have the very latest Bluetooth 5.0 which is better than the v4.1 in terms of frequency transfers and connectivity strength. Even though the headphones use Bluetooth 5.0 and a power hungry feature ANC, it still manages to provide a range of around 30 hours on a single charge. On the earcup, you get all the major controls you will ever need. Buttons to control the volume, a button to answer the call, ANC on/off switch, controlling music, and a button to switch easily between your calls and music. Just to let you know, turning off Active noise cancelation when not needed could impact the battery range. Talking about how good the Active noise cancelation works on these budgeted headphones, it’s good. it can easily cancel out airplane cabin noise, traffic noise, noise in a crowded office, and a lot of other noises that could distract you from working or just listening to music. Along with the Active noise cancelation and Aptx Hi-Fi technology you get an amazing audio experience. 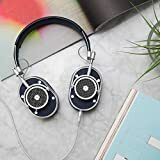 the audio reproduction is highly detailed, and you would surely be able to hear the things that are hard to listen to any other normal headphones. It gets even better because of the seamless Bluetooth 5.0 transmission. Though the sound quality is good, the bass is on the weaker side. And it gets even weaker with ANC turned on. You can clearly feel the bass difference when you turn on the ANC. 30 Hours of battery backup. Extremely beautiful design with soft earcups. If you not only want over ear headphones, but like to have a pair of active nosie cancelation headphones, and that too at a decent price point, then SE7 should be the headphones you must look at. Everything from the sound quality to the comfort is satisfactory, but the bass is not that good. The chances are you haven’t heard about the brand Aiva yet. We didn’t heard about them too, untill someone recommended us to try their ARC-1 wireless over ear headphones. ARC-1 is a mid-budget headset that comes with exceptional audio engineering. As compared to Cowin SE7 above them, they sound much better but do not have the Active noise cancelation integrated. 20 hours of battery range with quick charge. Protein and genuine leather pads. Very lightweight at around 8.8 ounces. 40mm bio-cellulose drivers with Aptx. On-ear controls & In-built microphone. We would not think twice before saying that these are one of the best sounding headphones. The audio framework used in them is very advanced and powerful. The headphones overall use 40 mm dynamic bio-cellulose drivers with Aptx low latency codecs and 24 DSP. More information on this mechanism and the performance would be discussed later in this review. Talking about the build quality and the design first, everything is neat and basic. The headphones are build up of both metal and plastic. To be very specific the headband is made up of metal and the earcups are made up of sturdy plastic. The manufacturer has done 180-degree padding on the headphones, which means the full headband is covered with leather and protein padding, along with the earcups. So even if you have a large head, and the fit is tight, the headphones would be comfortable for you from all three sides. Along with the headphones, you get a lot of good accessories. They come with a rugged case that would make it easy for you to travel world them. The cord is ultra durable, made up of nylon, shielded with anodized aluminum. It’s really important to talk about the connectivity on these headphones. The headphones come with Qconnect technology and multipoint to provide seamless connectivity to multiple devices at the same time. You can connect two devices to the headphones at the same time. You can also connect another pair of headphones to ARC-1 and share the same music on two headsets. The battery is good too. It’s not the best on this list, but 20 hours on a single charge is pretty impressive. On top of that, you get the integrated quick charge technology that can give you 3 hours of juice on 15 minutes of charge. The battery could be monitored from the indicator present on the top of the earcup. Getting back to the sound quality, the Arc-1 brings out audiophile audio quality that is pleasant to hear, and credit for that goes to a two-piece, stiff biocellulose cone. This allows the cone to move freely and prevent backup distortions for clearer sound and great dynamics. One of the best sounding headphones. 180-degree padding on the headband. They easily beat few of the most expensive and popular headphones in the market in terms of sound quality. Yes they don’t have ANC, but that’s acceptable looking at the price point which is very low as compared to high end headphones. Treblab is known for creating budget friendly audio accessories like headphones, earphone, and speakers. The Z2 over here are sports wireless headphones that come with Active noise cancelation at a low price point. These are recommended for people who are looking to get a pair of wireless over-ear headphones for gym purpose. T-quiet active noise cancelation technology. 35 hours of battery range on a single charge. Aptx Hi-Fi and sound 2.0 technology. Uses Bluetooth 4.2 for connectivity. Could be used in both wired and wireless mode. We would like to start off the review by saying that do not expect too much from the overall design. The build quality is nice, but the overall look is nothing special. The headphones are all matte black in color with glossy design on the top of the earcup which gives them a feel of the cheap headphones. Though the design is not too good, everything else is exceptional. And, we would like to start off with the specification that we absolutely loved on these headphones i.e. battery. We previously thought that C0win SE7 has the best battery range of 30 hours, but that’s not true. The Trelab Z2 has defeated the SE7 with a massive battery range of 35 hours on a single charge, but it couldn’t be quickly charged as similar to few headphones. This insane battery range is achieved by the integrated PlayXtend battery inside the Z2. The Active Noise cancelation on Z2 would not be as similar to other headphones as it comes T-quiet active noise cancelation, AKA Noise cancelation technology CVC 6.0, which surely cancels out a lot of noises like crowd and traffic, but not something like airplane cabin noises. So if you are going to get them for traffic, home, gym or office, then you should be fine. The other thing that needs to be talked about is the comfort quality on these headphones. First of all, since they are made of just plastic, the overall weight lies at around 8.32 ounces, which means that would not put pressure on the head. Apart from that, they have good leather padding on the headband and ultra-soft cushion padding on the earcups for supreme comfort. Getting into the audio experience on these headphones, the manufacturer has integrated some great technology to make sure you get a wonderful experience. The 40mm drivers are backed up with Aptx neodymium magnets, advanced sound 2.o technology, and Bluetooth 4.2 for better frequency transfers. The highs are clear, and the lows are decent, not too punchy, just good, and the midrange is clear too. The sound of the headphones is good, and the comfort quality is good too. But, you need to remember that these headphones have CVC 6.0 noise cancelation, also the design is not too good looking. We highly recommend you to compare these with Cowin SE7 before making a decesion. If you haven’t heard of the plantronics brand, then you haven’t probably ever digged into the popular headphones in the market. 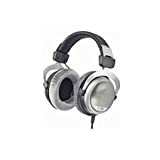 The backbeat series is a popular series of headphones that come with Active noise cancelation at a decent price as compared to high-end headphones. The most interesting thing about the headphones is the connectivity range. Insane connectivity range of 330 feet. 24 hours of battery range. Multi-point connectivity (more information below). Smart sensors for auto pause/play. Rich and Immersive sound quality. Apart from all the features that you get to see in any good headphones, the backbeat pro 2 comes with some additional features that are not just interesting, but also very helpful. The most favorite feature of us on these headphones is the connectivity range. 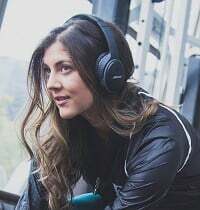 On any standard Bluetooth headphones, you generally get a connectivity range fo 33 feet, but on the backbeat Pro 2 the connectivity range is extended to 330feet, but that would be only available with the devices that have Class 1 Bluetooth. The headphones also come with multi-point connectivity, which means you can connect two devices to the headphones and can switch seamlessly between them. For example, you have connected your headphones to your TV and mobile phone and you get a call on your phone, now the headphones will cut the sound coming from TV and will give preference to phone call. Even though the headphones are packed with so much technology, you still get a really good battery range. You get a continuous playback of 24 hours on a single charge, and once the battery gets exhausted, you can either recharge it or start using it on wired mode. 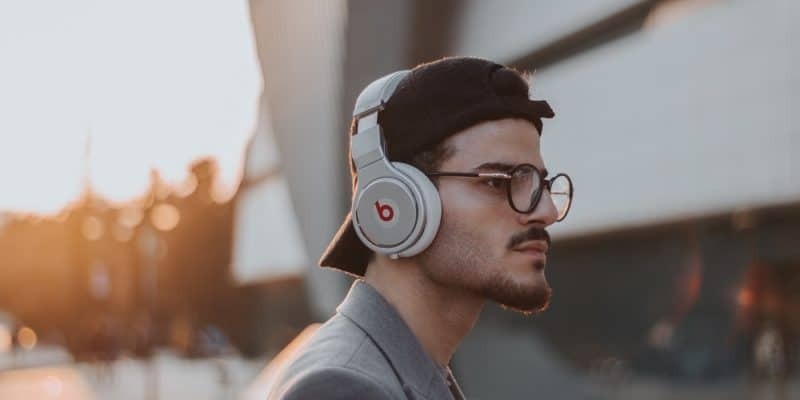 The headphones feature sensors that pause the music as soon as you remove the headphones from your head, and resume it as soon as you wear them back. This not only saves you some hassles but will also improve the battery life as we all have the habit of keeping the music playing even after the headphones are taken off. Last but not least, the headphones come with rich, immersive Plantronics signature sound quality. The sound quality gets even better with the integrated Active noise cancelation technology. 330 feet connectivity range on Class 1 Bluetooth devices. Good battery range of 24 hours. Active noise cancelation is average. The Plantronics Backbeat 2 might not be the best headphones on this list, but in terms of few specifications it is surely ahead of few headphones. These could be perfect for users looking for branded headphones at a decent price point, not too cheap, and not too expensive. B&W is a high-end brand that creates premium quality, ultra beautiful headhones. The PX model over here is a smart headset that comes with adaptive noise cancelation and optimized music performance. We are 100% sure that everyone is going to love the beautiful design of these wireless headphones. Bluetooth 4.1 connectivity with aptX HD. Smart sensors for auto Play/pause. Adaptive noise cancelation for optimized performance. Extremely beautiful design with great comfort. 22 hours of battery range on a single charge. A dedicated app for customizing the sound. First of all, these are not cheap or mid-budget headphones. They are expensive, and with that, we mean really expensive. If not the most, they are surely one of the most expensive headphones on this list. Getting into the review, we would like to talk about the build quality and the overall design of these headphones first. The PX is surely the best-built and most beautiful looking headphones on this list. The build quality is top notch, and you can not see a single piece of plastic on them. It’s all premium metal that is sturdy and also lightweight. Most of the design of the headphones look like a grill, but in reality, it’s not. On the top of the earcups, you get B&W branding that looks really neat. To make sure that you don’t any comfort issues with these headphones, the manufacturer has added an ample amount of padding on both the headband and earcups. The headband comes with leather padding on the center, while the earcups come with leather earpads with a ballistic nylon outer for even more comfort. For noise cancelation purposes, the PX uses Adaptive noise cancelation technology that comes with 3 adjustable modes, so that you can adjust the level of noise cancelation according to the scenario. The 3 ANC modes are City, Office, and Flight. The office mode offers light ANC and a powerful sound, the other two modes offer stronger ANC, but surely compromises in terms of sound quality. The other good thing about the PX headphones is the smart sensor comes with. the headphones auto turn on as soon as you put them on your head and auto turn off as soon as you put them off. This not only saves the hassle of turning them on/off but also helps you in saving battery. Talking about the sound quality, The PX headphones use Qualcomm aptxHD technology to deliver crystal clear wireless audio. The mids are accurate and treble is clear, the bass is precise but could be a bit strong for few genres. Also as per our experience, the sound quality is better when the ANC is completely turned off. Multiple Adaptive noise canceling modes. Smart sensors for auto turn on and off. 22 hours of battery range. Noise cancelation affects the sound quality. The PX are surely one of the most beautiful wireless headphones in the market that are also very durable. But, if we compare them to similarly priced headphones like Bose QC 35, then they are not as good as them in terms of sound quality and noise cancelation. For those who are not aware of the brand, Master & dynamic is known for producing audiophile headphones. The MH40G1 are wired headphones that come with lambskin-wrapping and two heavy-duty woven cables. The design is highly detailed, and the headphones are available in a lot of different color variants that would be loved by the users. Premium design built of high-quality leather and machined metals. Comes with great noise isolation. Runs on Bluetooth 4.1 with aptX technology. Comes with 3.5mm/6.3mm gold plated adapter. After Bowers & Wilkins PX headphones, these the probably the most beautiful headphones on this list. The headphones are built up of machined metals and with an excellent leather covering on some parts. The headband in itself is very thin and flexible that makes the headphones a good fit for people with large heads. The body is quite durable in itself. It’s made up of aluminum, enhanced with stainless steel in the areas prone to high-strain. One thing that we surely missed on these headphones is the Active noise cancelation. Yes, the headphones are closed back that create a good amount of noise isolation, but looking at the price point of these headphones, excepting active noise cancelation is fair. The headphones also perform very well in terms of comfort. The memory foam earcups and inner headband are covered with soft lambskin that provides endless comfort and allows you to listen to music on them for countless hours. You also get extra different colored lambskin earpads with the headphones to give them a different look, or as a replacement when old ones start tearing off. Talking about music, Master and dynamics are known to create high-grade audio accessories. The MH40 headphones feature custom-tuned 45mm high-performance neodymium drivers that deliver professional-grade sound quality with every small detail coming to life. The bass is very precise, not too boomy or punchy, something that you would like. Very sturdy and beautiful design. Lambskin wrapped for supreme comfort. Do not come with Active noise cancelation. Master and Dynamic MH40 are good souding headphones that have a very unique and neat design. The very soft lambskin covering add alot of comfort to the ears. The only thing that we miss is the active noise cancelation. If you have come down this far, then you must have probably read the reviews for the headphones that are mentioned above. This additional buyer’s guide with further refine your thoughts on how to choose the best over-ear headphones for yourself. First of all, you have made a really good decision about going with over-ear headphones instead of on-ear headphones. Over-ear headphones are more comfortable and provide a better audio experience. Before we move on to the buyer’s guide, let’s see how over-ear headphones actually differ from on-ear headphones. Earcups on-ear headphones are relatively smaller as compared to over-ear headphones, which allows them to rest just on the top of the ears. They don’t completely cover the ears which means that you can still hear to the surrounding sounds along with the good music. On the other hand, earcups on over-ear headphones cover the ears completely adding a flavor of noise isolation. which ultimately the overall audio experience, but also makes sure that you are not disturbed by the surrounding noises. Below are the things you need to consider before going for a pair of over-ear headphones. Back in time, everyone used to say that wired headphones are better than wireless headphones in terms of sound quality, which was absolutely true. Headphones at that time were running on older Bluetooth versions, which didn’t offer great connectivity and frequency transfer like we get to see today. But technology has changed now! Most of the wireless headphones today come with Bluetooth 5.0 or 4.1, which offers improved connectivity and better frequency transfers. So it doesn’t actually matter what type of headphones you are choosing, both types will offer great audio experience. However, if you are going for an active noise canceling wired headphones, then get ready to carry an external ANC module, while in case of wireless headphones the module is in-built. 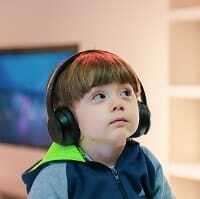 If you are looking for over-ear headphones, then you must be most probably aware of the term noise isolation. For those who are not aware, Noise isolation refers to the ability of the headphones to block out external noises. But, don’t confuse it with active noise cancelation. ANC is a mechanism that uses a microphone to pick up the surrounding noises and then produce sound to cancel it. It basically produces counter sound to cancel out ambient noises. On the other hand, the quality of noise isolation totally depends on the fitting of the headphones. The tighter the fit around the ears, better the noise isolation. What should I choose? Noise isolation or Noise cancelation? Noise cancelation headphones offer better audio experience, that’s just the truth. But that audio experience comes at a higher price point. Also, the ANC headphones are suitable for users who spend time in other noisy areas, for those who plan to use the headphones just in their home, would be satisfied just with the noise isolation. Build quality should always be great for any type of headphones. We have used headphones that started breaking off in just a few days, and we have also used headphones that lasted for years without any damages. For the headphones that are mainly built of metal, you don’t need to worry about as they are very robust in nature. For headphones that are mainly built of plastic, you must do proper research and see if that plastic is sturdy. For all the headphones mentioned on this list, you don’t need to worry at all. All the headphones are built up of solid materials that will last for a long time. While evaluating any type of headphones, comfort quality is always on top of our priority list. You can have the most futuristic headphones with intelligent connectivity, Hi-Fi sound, great design, and other awesome features, but if the headphones are not comfortable, well then the game is over. There are a lot of factors that contribute to the comfort quality of the headphones. The weight of the headphones, the flexibility of the headband, padding on the headband and earcups, and the drivers. According to us, the weight of the headphones should be close to 10 ounces. In rare cases, you can extend that up to 15 ounces, but anything above that could be heavy for the head. Regarding padding, there is actually a lot of padding types available in the market while Memory cushion being the most popular out of them. You must have a look at the thickness of the cushion padding. It should not be too less on the earcups, and not too much on the headband. You should also do research, and make sure that the drivers don’t heat too much. Heating wouldn’t allow you to use them for multiple hours, even though if they are too soft. Wired or Wireless, the controls are generally present on the earcups in the form of physical buttons. In few of the recently released high-end headphones like Sennheiser PXC 550 and Sony M3, you get to see no physical control buttons, everything is controlled simply by touching the top surface of earcups as these type of headphones come with intuitive touch controls. 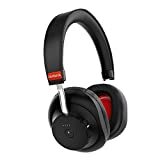 Talking about the type of controls, a pair of over-ear headphone must have volume controls, control to switch tracks, control to answer/reject calls, and if the headphones have Active noise cancelation. then a dedicated switch to control that.